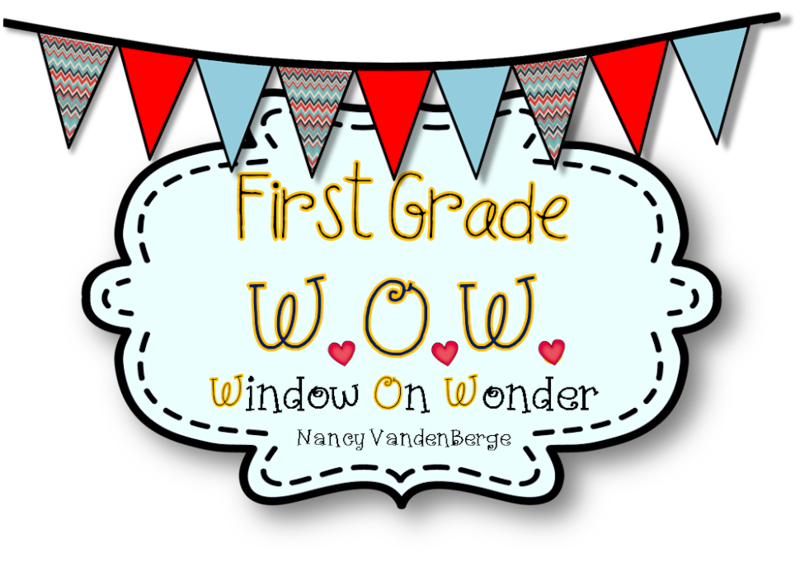 Thanks for stopping by our blog to see what's happening in our first grade classroom! This week we are working very hard on "retelling"stories we have read. Learning how to retell a story helps our little learners as readers and thinkers. It helps to organize thought, and recognize the thoughts we have during reading. It helps us recognize when our thinking changes throughout our reading. Characteristics of good retelling are: using character names, telling about the setting, including the happenings or plot (beginning, middle, and end), discussing the problem the character is having, and describing how the problem was solved. Today I introduced our "retelling rope." Each symbol represents the parts of a story. I have used retelling ropes before, but revamped this with some better visuals. The kids really get it when they can actually manipulate the parts. This year I wrote a simple poem to go along with our retelling activities. We practiced retelling several stories together using the large retelling rope, and then the kids got to make their own mini one to manipulate during their own reading time. After putting these together, some kids chose to work with others to retell a common story (The Lorax has become a favorite for some reason :) !) We also practiced recording our retelling thoughts. We will continue to work hard on this important skill! When I read a story! I love helping kids improve their retelling skills!! 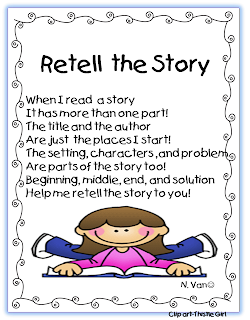 Don't forget to retell your own stories with your kids!!! I love love love your blog!! You have amazing and such creative ideas on here!! I was wondering if you had the copy of the retelling rope pictures for the kids to make their own? those pictures are perfect and I would like my kids to make their own! Thanks a bunch!! I am so impressed with your site. I have gotten so many great ideas. thank you so much! I cannot wait to use this idea with my students! I just wrote a post about using your printables. Thank you so much. My kids have loved retelling this week. I wish I had known about this strategy sooner. Your site is amazing. I love all your creative ideas and how well you put your units together. Where did you get all of your clip art? Do you believe in the Daily 5 program? What do you do for reading and writing? What a great idea! Thanks for sharing so generously... I can't wait to make these with my kiddos. Love your site. I've taught Pre-K for the past 4 years and will be teaching 1st next year. I've enjoyed your website in attempt to prepare myself for next year. Clearly your blog is awesome and I am your newest follower. I can't wait to use more of my cleaning time procrastinating at your blog! Come visit me sometime! Wonderful and so creative for retell. Thank you! Students will love this! Wow, I can't wait to use this! Oh,these are wonderful!!!!! Thank you so much. Thank you so much for sharing! This is fantastic. I was just wondering how you had your students attach the pictures to their rope. Masking tape? Thanks Nancy! I was also thinking of maybe getting some foamy beads for the beginning, middle, end part. Came across your blog and love the retelling rope. I teach kinder and the big pictures will definately go up in my reading area. Thanks for sharing! Now off to look at your other amazing items! I love your blog & just saw your retell rope. I was hoping to use it and the poem with my first graders. I can not seem to download it from the site, is it possible to email me the pdf? I love this retelling rope. Especially that each kid will have their own rope! Very cute! P/S I am your newest follower. I cannot even begin to tell you how much I LOVE YOUR BLOG!! I have never met a teacher SOOO willing to share (for free no less) than you. 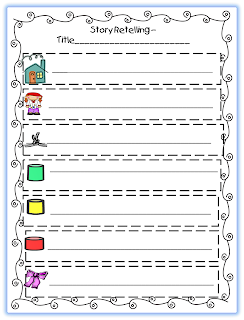 You are the very first place I start my lesson planning each week and I often "brag" about you at school. You are amazing and you have a HUGE heart to share with all of us the way you do! I hope that God blesses you each and every day! Thank you so much for your sweet words. I truly love sharing and knowing someone else can use something I have found to work with my kids!! Believe me when I say I am the one who is blessed!! Thanks for all your ideas and creativity. One question though--how do you organize all those lessons? Do you do it by standards, themes, or what?For example--all those stories you do with standards--I can't figure out how to organize/store them!! Any suggestions would sure be of help!! Thank you so much! 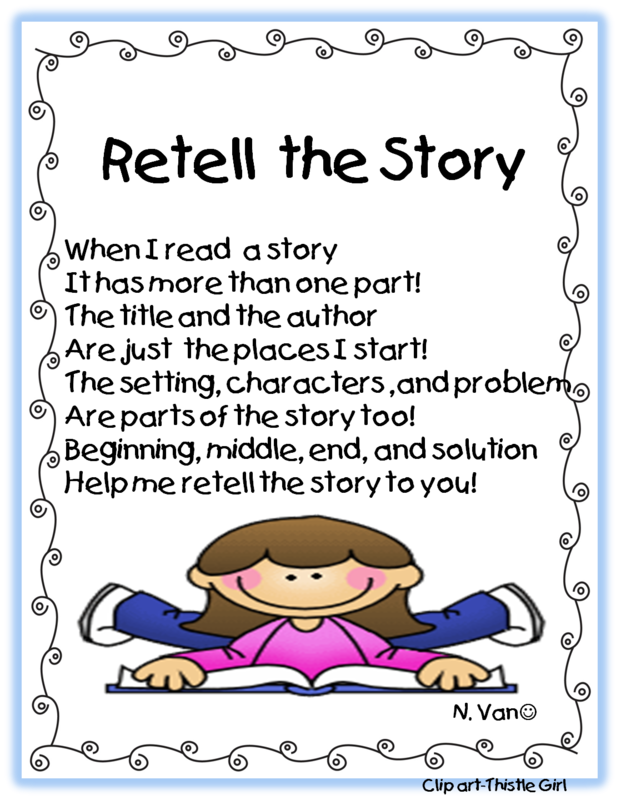 I believe this will be a fabulous strategy to help my kids with their retelling. Absolutely love this site.. it is amazing.....just love your concept. 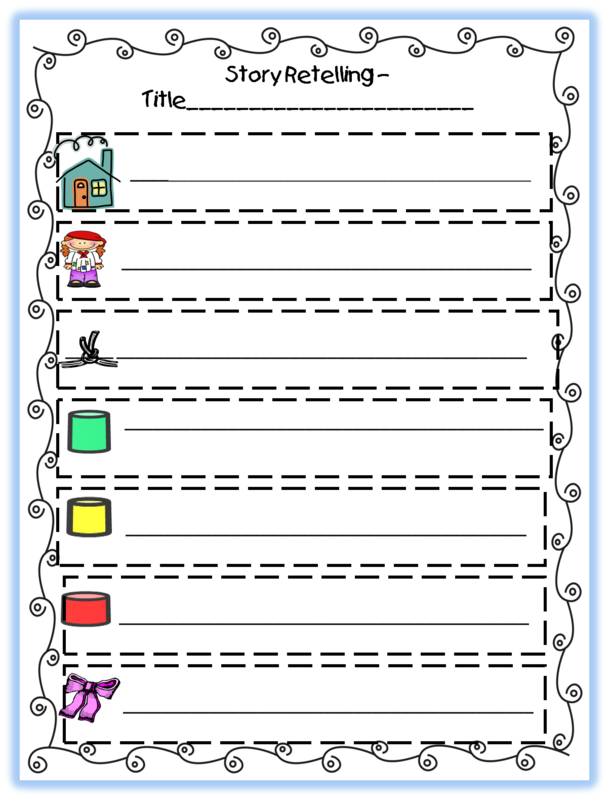 I am a speech therapist who has been using the story retelling rope for my 1st-5th grade students for a little over a month. It is awesome, my kids understand how to use it, and love to use it independently. Thanks!!!! LOVE this. I used it all the time this year! I love your idea for the retelling rope. I have been teaching my students to think about the story events as beginning, middle, middle, end. This encourages them to tell me more about the middle of the story. 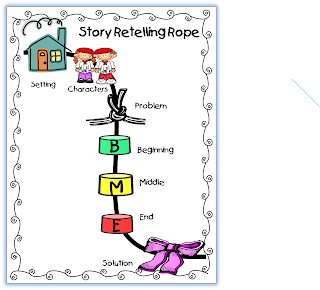 I see how to add an additional yellow middle on the retelling rope. I was wondering, if you could on your sheet add an additional middle icon on the poster where the rope is connected and the icons are labeled. Also add an additional middle icon on the page where the students do a written retelling. I love your blog. I use it often! Thank you for the awesome ideas! Just a question though-isn't the story's problem part of the ''Beginning'', and the how the problem is finally resolved part of the '' Ending'', with the failed attempts to resolve the problem and other events in ''The Middle? Thanks. Thank you for the retelling rope resource! This was just what I needed for my 1/2 class. This blog is for fellow educators, parents, and friends! I love reading and learning from your comments! Please share your thoughts! Stop and Smell the Roses...or look at Moths! !